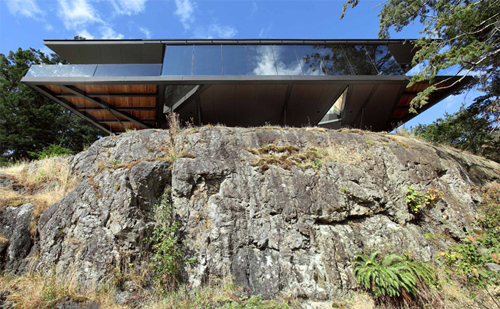 Tula House is located on a remote island, at the edge of a cliff, 44 feet above the Pacific Ocean. The topography of the site is highly irregular; the prospects diverse. Views to the east stretch over the open water and islands of the Strait of Georgia to the mountain ranges on the mainland of British Columbia. Views to the south overlook a small tidal basin. Moss covered basalt hills are interspersed among treed expanses and richly vegetated crevices, valleys and swales. Stands of red alder and big-leafed maple enliven the predominantly dark fir forest. The beach below the house is littered with the flotsam and jetsam of the ocean where logs and rocks have been tossed around by the tides and storms like a child’s game of “pickup sticks”. One site is actually many sites. 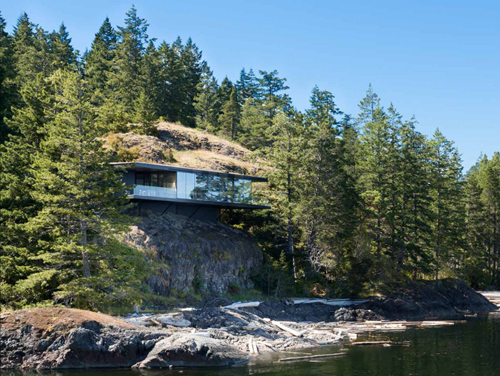 The geometric and spatial order of the house reflects the casual irregularity of rock ledges, beach and forest. Low rock walls edge a gravel approach to the house. 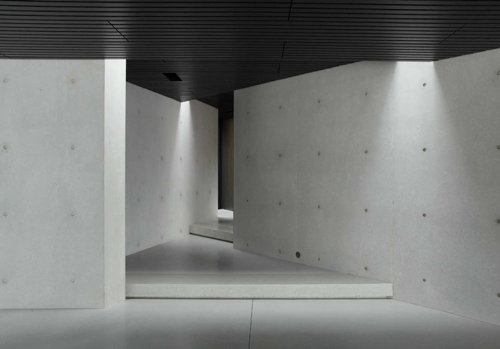 A loose arrangement of concrete walls, clad in staggered fibre-cement panels, begins to describe space. These panels are black in color. 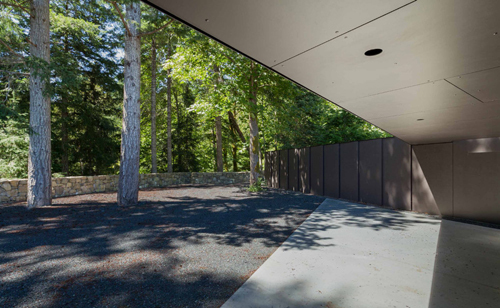 From a distance, the house visually recedes into the dark forest. 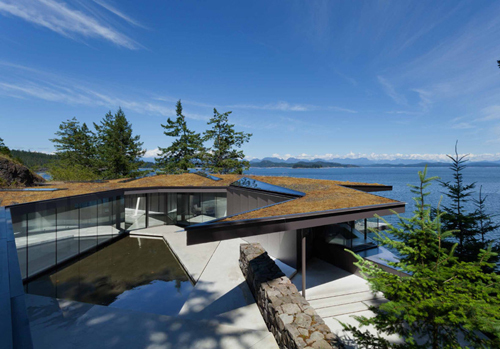 The roof, planted in moss and native ground covers, appears from above to be continuous with the surrounding ground plane. 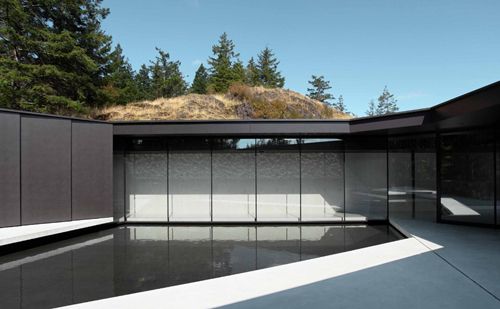 Groundwater flows continuously through the site where it is captured momentarily within an entry courtyard. The ground plane of the courtyard and interior floor of the house are large shard-like concrete plates. 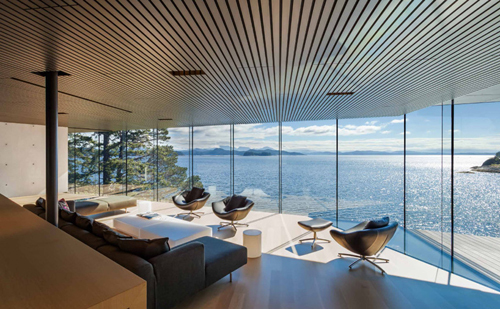 Within the house, spaces are defined by a series of slowly unfolding concrete walls that channel the flow of space through to ocean views. 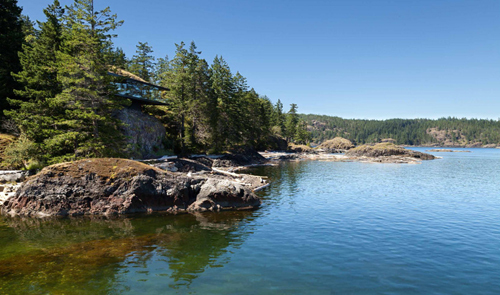 This primary flow is diverted in passage by eddies of secondary space which branch off, separating and focusing moments of diversity in the site: the small tidal basin off the kitchen nook, a ledge of moss covered rock in the bedrooms, a view back from the court to a swath of deciduous trees. 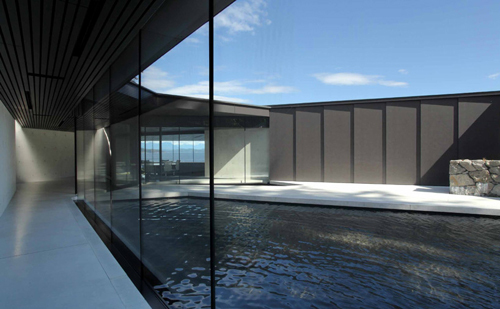 A steel-framed roof mirrors the order of concrete walls and floor plates. Narrow skylights project lines of light at oblique angles through space. 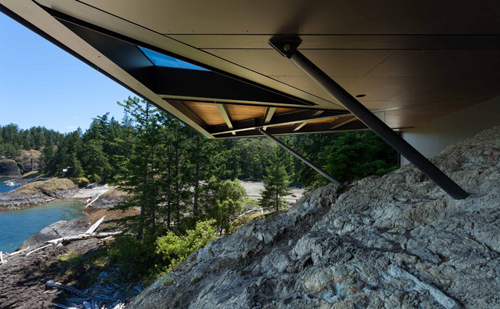 At the cliff-edge, the solidity of concrete floors is left behind. 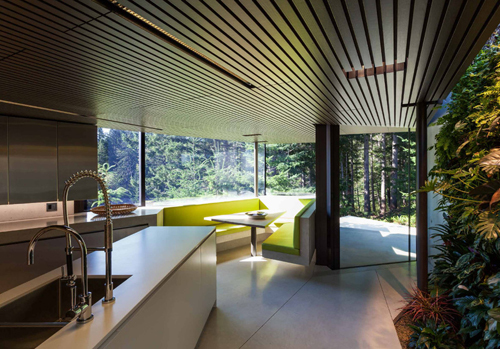 A steel-framed, wooden deck is cantilevered into the air. 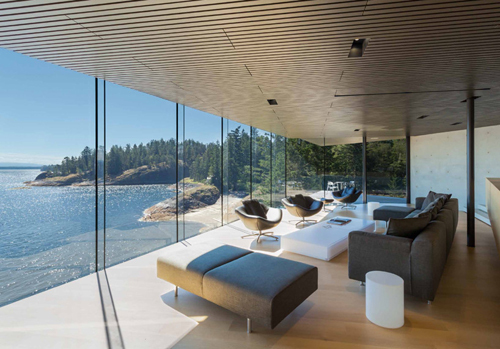 While an uninterrupted expanse of glass takes in distant, sublime views of the Straight, glazed apertures in the floor of the living room deck open vertiginously to the textures and sensual immediacy of beach and ocean below. 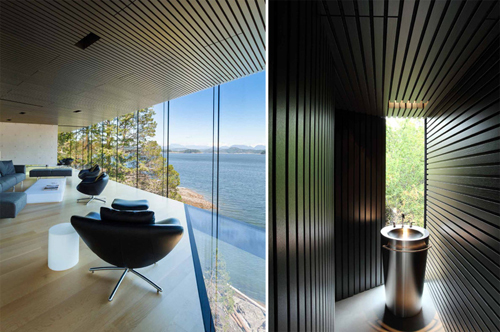 Millwork elements float freely within the spaces like the flotsam and jetsam on the beach.